W elcome! This is what you've all been waiting for, well, I sure hope so! A whole new series to add to our collection of fanfic. I actually had this written more than a year ago, but various events prevented me from posting it until now, including my 6 odd month period without the 'net, and the fact that I had 2 other stories to post (Fall of Evil and Requital, which you should have read), plus the fact that I don't have much time to update as often. It's the first book in a new series, and 8th in the whole collection. Anyway, here it is, a story set around a year after Fall of Evil, and this one delves back into Link's past trauma of Kylara, and meanwhile, a new enemy has infiltrated the defences of North Castle... introducing our very first real female villain! Link still feels the demons from his past, and a need to exorcise them once and for all. Alone, save for his faerie companion, Sprite, the troubled young hero travels to his home country of Catalia, to visit the graves of his Kokiri tribe kin, Kylara and brother Hayden. However, in Gardarika Town, last refuge of his old family, Link recieves less than a warm welcome. His kin are out for revenge against his 'traitorous' actions, to avenge the death of Kylara, and Link is their primary target. Stranded in a hostile land with no-one to help, Link finds himself in a terrible plight from those who were once his friends. 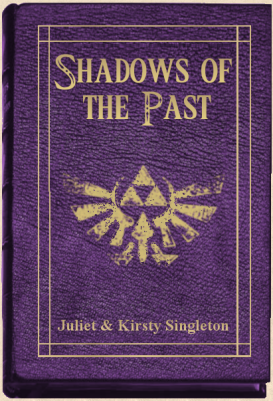 Meanwhile, back at North Castle, his estranged love, Princess Zelda suddenly has troubles of her own. A death threat, evil visions, palace guards murdered... it's clear that someting, or someone, has a vendetta against her. But without Link there to protect her, Zelda is scared. Very scared. And it's not just her who is in danger.